Doves are easily one of the best uplifting, epic album bands of the last decade and the thought of this b-sides album is exciting. Lost Souls was an unstoppable debut filling the listener with both a heavy sense of hope and sadness. The Last Broadcast was even tastier, taking them to heights last heard from U2 in the late 80s. So, Lost Sides, a collection of b-sides from the band's eight singles, should make an excellent companion piece to the previous records and a nice distraction while they record their third. Originally released back in 2000 as a limited promo with a different tracklisting, this compilation has been updated to include the favorite "Hit The Ground Running", along with some other Broadcast singles. 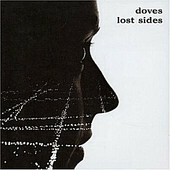 Because Doves are such a glorified and cherished rock band, it's difficult to admit this, but Lost Sides is quite disappointing. Though it's understandable that these are lesser songs because of their b-side status, the magic captured in the a-sides and album tracks is just so distant and sometimes non-existent here. Alternative versions of "Break Me Gently" and "Sea Song" feel like wasted space, as they're given instrumental and wanky space-rock treatment that fails to deliver any satisfaction. The band's exploration of Chemical Brother breakbeats on "Crunch" are unfortunately laughable, proving only a band like Primal Scream can pull a healthy blend of electronica and rock. Thankfully though, there are some very strong moments, like the good time feel of the aforementioned "Hit The Ground Running" and the Badly Drawn Boy-esque "Valley". Because Doves obviously didn't have enough juicy bits to pour into this collection, you'd be better off investing your money into the near-perfect DVD Where We're Calling From, which is a thoroughly enjoyable experience.